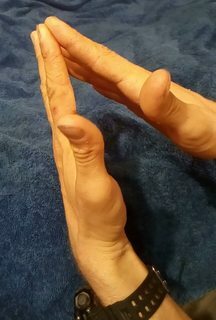 I was trying to search for a matching hand mudra where just three fingers are touching the other hand with the others apart. I learned it along with a basic ground stance of maintaining three to four points of contact with the ground. Other than that it was supposed to have an official martial arts style which used the same mudra. I was hesitant to just show pics of it so you'll have to bear with me on any minor hand position mistakes. Also, note that there are only three fingers for contact plus my body itself for a possible fourth. 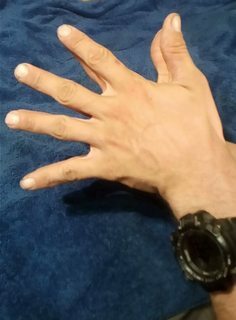 It does differ from the Hakini mudra, which connects all fingers, in case there is a misunderstanding. Yes! If you go to the Google Play Store and simply enter 'Mudras' into the Search field, you will see, most likely, 'Mudras Apps' appear as one of the choices: that is what you want to click on. You are, I think and hope, going to be very pleased to find several apps! Oh, and make sure, before you install any of the apps, to click on the green 'Read More' link for more information. With several million apps on thousands of subjects, you can easily understand the sad fact that with that many apps, they can't all be good or even exactly what you are looking for sometimes. However, you did mention that you were wanting a record or detailed list of Mudras. I can tell you with confidence that you will be able to find at least a couple of apps with clear visual and written techniques on several different ones [Mudras], and even cross-referenced into, for example, desired effect or unblocking of a particular energy flow, or even by ailments. I personally have installed, and used 3 different apps. Two of the 3 exceeded my expectations, and the third one was mediocre, though I was still able to glean a fair amount of information for my needs at the time. I am sorry to say I am terrible at remembering the exact names of the apps. As I said before, though: Read the finer details to ensure that the apps or apps you install meet your needs. I am sorry to say that I am not familiar enough with Mudras to quite understand what you meant by an Official Record of any of the Mudras that I have ever seen and/or tried. Not the answer you're looking for? Browse other questions tagged training identification or ask your own question. Self defense with one hand tied behind back? Is there value in using weighted clothing in martial arts training? Can there be too much training?